We just finished renovating the whole hostel in June 2012. 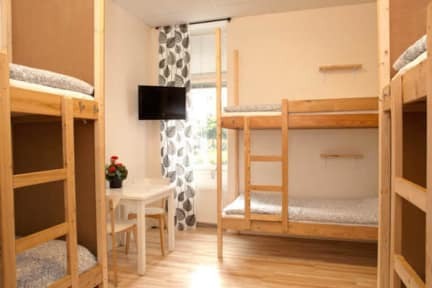 We offer beds from 180 SEK per night. We have 65 beds divided into single, double, quadruple and six-bed rooms as well as two dormitories, one of which is mixed and one for women. All rooms with one, two or four beds are equipped with a TV. The dormitory has 20 beds divided into alcoves with four or two beds in each. The alcoves consist of thin walls and curtains. Around all the beds are also draperies that can be closed for privacy. The female dormitory has eight beds, all of which have draperies that can be closed for privacy. As our guest you have access to two kitchens and a living room with TV and wireless internet. It is possible to borrow our laundry room if it’s vacant. Please note, sleeping bags are not allowed. Bed linen for rent or bring your own set. We have parking outside the hostel which is free to use if there are vacant spaces. For everyone’s comfort the hostel is completely non-smoking. The hostel is fully accessible. Çok beğendim bir gün mutlaka tekrar ziyaret edeceğim.